The act of adopting a child today is seen as a unified effort between multiple parties to provide the best results for children in need of a home and a loving family. Modern practices have made options such as open adoption available, providing adoptive parents and birth mothers with more power in determining how their child is raised. For those looking for an adoption agency in California, turn instead to our private team. A is 4 Adoption is proud to be your local adoption center for quality services nationwide. Our founders went through the stress and waiting associated with the adoption process, and decided to start their own company to provide guidance, support, and productive results. Our success can be attributed to our wholesome approach for everyone involved. Today, we’ll discuss how beneficial our adoption services can be for everyone involved. If you’re pregnant and unsure how to proceed, or you want to learn how to adopt a child, be sure to contact our team today! Adopting a child is a noble act, and one that would ideally be rewarded efficiently to everyone’s benefit. Unfortunately, many loving adults are left waiting in suspense, unsure for weeks or months at a time if their efforts and goals will ever pay off. Our local adoption center works tirelessly to provide the best matches between birth mothers and adoptive parents, working to put you into an ideal situation. We pride ourselves on providing minimal wait times in a low-pressure approach, preventing you from needing to compete for an expecting mother. Instead, our adoption center works to set up personalized meetings to ensure both parties have the best opportunity to learn about one another. A is 4 Adoption excels in keeping communication lines open, reaching out to you often to ensure that every step in the adoption process goes according to schedule. Learning that you are pregnant can be amazing news, yet some mothers-to-be may find themselves unable to provide a quality life for their little one at this time. No, putting your child up for adoption is not irresponsible. In many cases, pregnant women are happy to learn that our California-based adoption serves are here to provide comprehensive birth mother help every step of the way. A is 4 Adoption is here to provide complete care for you throughout your pregnancy, including financial support for living expenses, groceries, and more. We pride ourselves on making this process as stress-free as possible, and are available 24/7 over the phone via our hotline (1-866-5MY-BABY) for mothers in need. Our center is bonded and strictly adheres to the State of California’s Adoption Laws, providing complete peace of mind for those considering putting their child up for adoption. 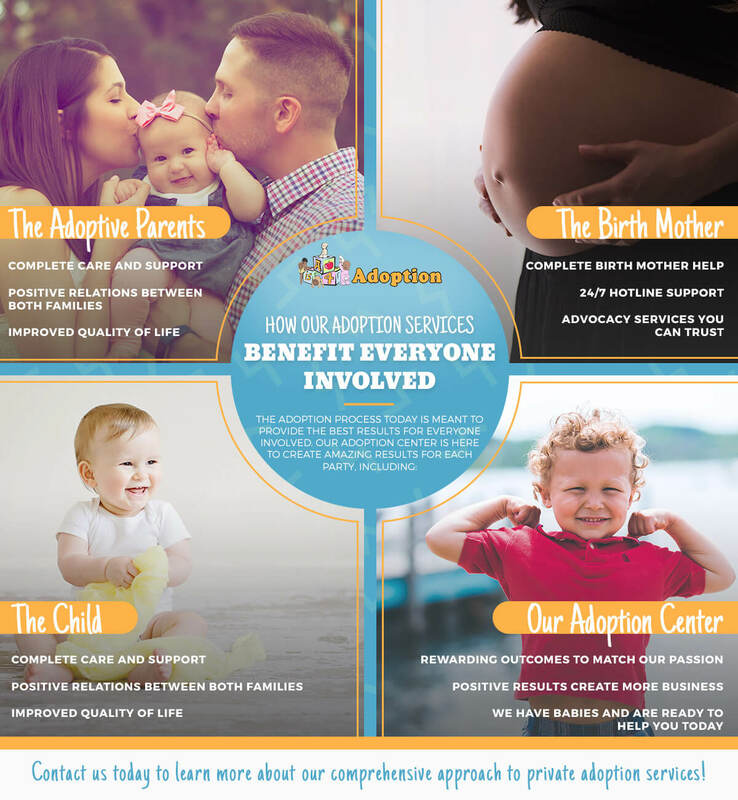 Ultimately, our adoption center works to provide the very best results for everyone involved to assist in creating the best outcome for the child at the center of it all. Brave birth mothers, loving adoptive parents, and our private adoption facilitators all put a lot on the line to go through the complexities and stressors involved with the adoption process. Why do people go through such hardship? For the child. Adopting a baby can prove to be a rewarding experience that grows your capacity to love even more. A is 4 Adoption is here to help everyone develop a positive and nurturing environment for the child, built on mutually approved plans by both parties. We strive to aide in creating lifelong support networks that enhance the child’s life. When the adoption process is complete, everyone involved benefits. The adoptive parents will be able to welcome a new addition into their loving family, birth mothers will receive complete support and peace of mind knowing they made a courageous sacrifice, and the child will receive the best support network possible thanks to open adoption. A is 4 Adoption was founded on a passion to help everyone in need throughout this amazing process. Our success in matching families and orchestrating the services needed to navigate this complex field and help to put our adoption center on the map, creating happy clients that are sure to tell others of their success. We’re here to provide the best outcome for everyone involved. Our team has babies in need of loving homes, and we’re happy to walk you through the adoption process. If you are looking to grow your family through domestic adoption, or you are pregnant and searching for quality support, be sure to contact us today!